Time to green up, guys! Because green beans are finally in season in our part of the US. Sure, we can buy “fresh” green beans other times of the year. But why bother? Too often they are woody, and their dull out-of-season flavor borders on soulless. But as spring rolls into summer, we can find locally grown green beans in abundance. They’re plump and tender— and their flavor is so robust, they don’t require complicated recipes. All they need is a quick vinaigrette dressing. Simple. Green beans are also known as string beans—because of the fiber “string” that used to grow up the side of each bean (and that had to be removed, bean by bean, before you could cook them). Those fibers are largely a thing of the past now. Modern agriculture has developed stringless beans with old-fashioned flavor. 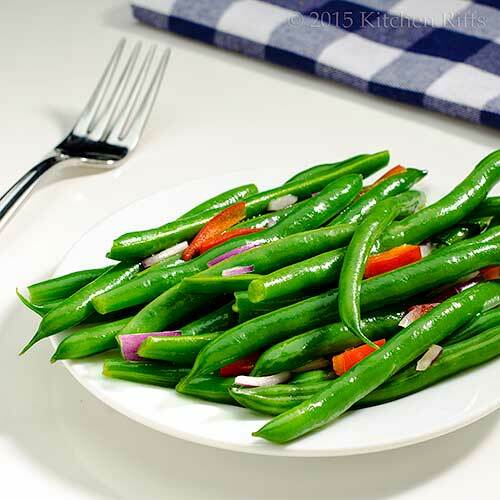 Unlike many vegetables, green beans generally are not eaten raw. The raw beans contain high levels of lectins, which can be harmful if consumed in excess (among other things, they can cause gastrointestinal distress). More to the point, though, cooking tenderizes green beans and releases their flavor. Long-cooked beans (like our Southern Green Beans with Bacon) can be delicious. But for most recipes, we prefer beans that retain just a bit of snap. So for this dish, we suggest cooking the beans until they’re tender, but still a bit firm to the bite. BTW, feel free to “eyeball” ingredient quantities for this recipe. Or substitute other ingredients for the ones specified. We offer some suggestions in the Notes. This recipe takes about 15 minutes of active prep time. However, you need to allow about 30 minutes for the cooked beans to dry off. And the dish tastes best if you marinate the beans in vinaigrette for an hour or two. So plan on starting this dish 2 or 3 hours before you’ll be serving it. The recipe serves about 4 as a starter course, or 6 as a side dish. Leftovers (ha!) keep for a day or two if refrigerated in an airtight container. Cook the green beans: Place a large pot of water (at least 4 quarts, but use a bigger cooking pot if you have one) on to boil. Meanwhile, rinse the beans. Snap the ends off (you can snap off just the stem end if you wish, leaving the pointed tip on). When the water comes to a boil, add the salt, then add the beans to the boiling water. When the water returns to a boil, set a timer for 4 minutes. While the beans are cooking, prepare an ice bath to cool the cooked beans—add 5 or 6 handfuls of ice to a large bowl, and fill with cold water. At the 4-minute mark, start testing the beans for doneness—pull a bean out, rinse it under water to cool, and bite into it. You want the beans to be tender, but with a bit of “bite” to them. Cook the beans until they reach the stage of doneness you prefer. Typically, this is 5 or so minutes for us, but it could take as long as 8. When the beans are done, drain them in a colander, then add the drained beans to the bowl of ice water you’ve prepared. Let them sit in the ice water for a couple of minutes to cool down, then drain the beans again. Spread the green beans on a kitchen towel to dry. Prepare the red onion: Peel the onion and cut it into thin slices or dice of ½ inch or so. Set aside. Wash the red bell pepper, then cut it into thin slices or dice of ½ inch or so. Set aside. Make the vinaigrette: Peel the garlic and mince it well (or whirl it in a mini-food processor). Place the garlic in a small jar or bowl that has a cover. Add the vinegar and/or lemon juice to the container. Add the olive oil, then cover the mixing container. Shake the container vigorously to combine all ingredients. Add the herb, if using, along with salt and pepper to taste. Shake again to combine. Set aside until ready to use. When the green beans are dry, place them in a large bowl. Add the sliced or diced red onion and red bell pepper. Add the vinaigrette and toss well to combine. Taste a bean, then adjust the salt and pepper if necessary. You can serve the green beans immediately, but we think they taste better if you marinate them for an hour or two in the fridge before serving (just place the green-bean mixture in an airtight container). 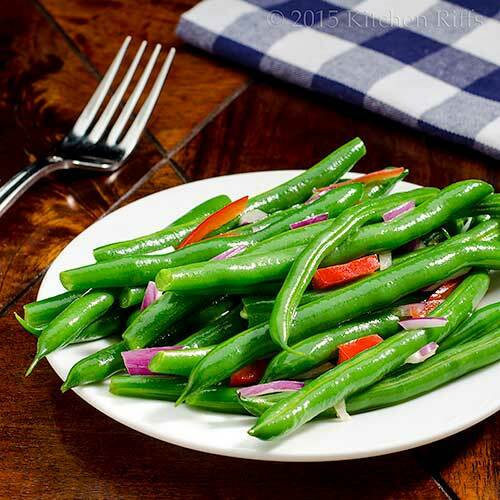 In some parts of the US, green beans are also called snap beans. Green beans range in shape from very thin to rather fat. Any kind will work in this dish, but try to make sure the beans you buy all have more or less the same diameter—they’ll cook more evenly that way. When buying green beans, snap one in half. Fresh beans snap crisply, and often are a bit juicy where you’ve snapped them. Why use an ice bath in Step 1? To stop the cooking process. It also helps preserve some color (the longer you cook green beans, the less bright they become). We strongly recommend serving this dish only during the spring or summer—using fresh, local beans. Out-of-season green beans just don’t have the same flavor. We like to serve this dish in place of salad at the start of a meal. It also makes a great side, especially for a picnic or cookout. You should salt the water heavily when you cook the green beans (Step 1)—this helps season them. We use Kosher salt, which is less salty by volume than regular table salt (because its crystals are larger). If using table salt, you may want to reduce the amount by about half. You can substitute ingredients in this dish to suit your taste. Shallots make a nice substitute for red onions. Canned pimento works well in place of fresh bell pepper. Feel free to add other ingredients too. Maybe a bit of cooked zucchini or corn. Or some hot peppers if you want to jazz it up a bit. If an ingredient sounds good to you in this dish, it probably will be. Much of the flavor in this dish comes from the extra virgin olive oil and wine vinegar (or lemon). So make sure you use good quality. We sometimes skip the optional herb when making this dish (especially since the other ingredients add plenty of flavor). But it does add a nice touch. As noted above, we particularly like parsley or fresh thyme. Chives are also nice, as is mint. But use whatever herb you have on hand—it will probably taste good in this dish. “Yum, great flavor for such a simple dish,” said Mrs. Kitchen Riffs. “That’s using your bean,” said Mrs K R.
“Hey, I’m one smart human bean,” I said. Yes! Hey wait a minute . . . .
Hi Nee, a little red pepper in this salad adds a nice zing! Thanks for the comment. I love the colors the red onion and bell pepper add to this healthy & tasty side dish. Looks great!! I cannot wait to finally get decent green beans at our nearby produce stand. Your recipe looks like the perfect way to showcase them! Love the simplicity and Vibrance of this dish. Thanks for a wonderful idea. Hi Pam, colorful dishes look so appetizing, don't they? Thanks for the comment. Hi Liz, this really is a wonderful recipe. 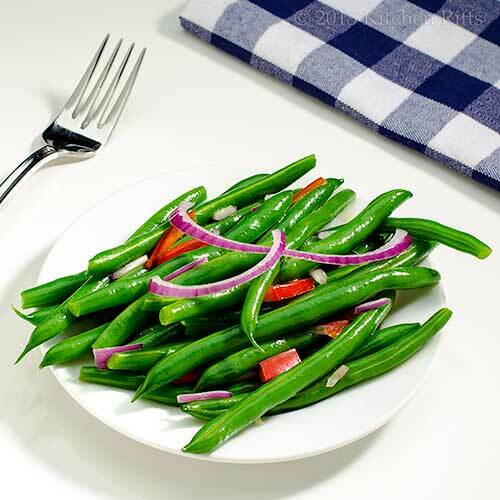 Our favorite way to enjoy green beans! Thanks for the comment. Hi Ansh, we love simple dishes like this. Particularly when they deliver the flavor this one does! Thanks for the comment. I love green beans and green bean season is definitely upon us. This recipe is so simple which makes the beans shine! Yes, the green bean are showing up in the market, but they are not that plump here, it gets better after a month. We still have the chilly weather on and off. This green beans will be a perfect side for some juicy steak. 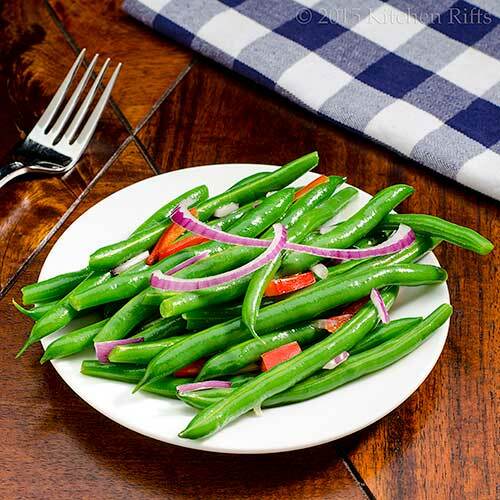 Green bean is one of my favorite summer vegetables and this is the perfect light salad to serve. Love the bright green color! I am such a fan of green beans and simple is so much better than complicated! My father used to eat cooked green beans with a slice of raw sweet onion and a couple of slices of garden tomatoes. That is one of my favorite sides :) Sounds like you have a pretty sweet bean! Oh, I do love green beans - unfortunately the season has just finished here:) But will tuck this away for next season. A healthy, flavorful summer dish... I love it! A really nice side to any dish! We love green beans in our house! I try not to buy them at any other time but summer because they really are the best then. We don't have any local beans yet, we're still struggling with snow, but spring is finally here, I think. I saw rhubarb at the farm stand and that's a sure spring signal! Love the bean salad, it's my favourite way to make them too. They need so little work and they taste fabulous. Hi Abbe, the season has just started here, but we've got several months of goodness ahead of us. ;-) Thanks for the comment. Hi Shibi, I was really lucky in getting these! The really good bean season starts in two or three weeks here. Thanks for the comment. Hi Holly, aren't green beans so flavorful? Love their color, too! Thanks for the comment. Hi Tricia, LOL! Green beans and tomatoes are an awesome combo (with onion, natch). Thanks for the comment. Hi Rachel, we sometimes get decent beans into fall, but not that often. Spring and early summer and middle summer are definitely the best times here. Thanks for the comment. Hi Denise, isn't this nice? We love it too! Thanks for the comment. Hi Raymund, it is, it is. ;-) Thanks for the comment. Hi Nazneen, isn't this a wonderful way to serve beans? Easy, easy, easy -- and sooo flavorful! Thanks for the comment. Hi Dottie, Three Bean Salads can be terrific, can't they? I love them too! And this one, of course. ;-) Thanks for the comment. Roast this salad and I am allllll over it! :) I adore green beans so much! Three cheers for being simple. I like simple foods too. It is the best way to bring out the goodness of fresh ingredients. Love the cheerful colours of your salad. Yep, this is what summer is all about - fresh green things. Fresh green beans are my favorite summer veggie and I just can't get enough of them. I usually serve then warm and hardly ever as a salad. What a great idea! Can't wait to find some good beans to make this. Thanks John! Hi GiGi, this is really good using roast green beans too! Thanks for the comment. Hi Anne, green beans are such a great veggie, aren't they? One of my favorites! Thanks for the comment. Hi Zoe, simple just comes kind of naturally to some of us. :-) Thanks for the comment. Hi MJ, we serve a lot of warm green beans, too, but really, this recipe is better. You'll like this! Thanks for the comment. Healthy, delicious and colourful salad! Its so appealing. Summer's over but I've saved this one for Spring. This looks so incredibly fresh and vibrant! This looks like the perfect side dish to meat! Simply delicious! P.S. Please click on my recipe post on top of the blog, when you visit me back. Thanks so much! Love green beans, raw, cooked, warm, cool. But even though I love 'em, and so does Mr. Rosemary, I decided not to grow them this year in my garden. Why? Because they're so cheap around here in August anyhow, and I can use the space for other not-so-cheap-and-plentiful things -- like shallots! Great recipe, John. Simple, clean. I can almost taste this lovely recipe through my screen :) .. so simple and tasty. Snapping fresh green beans on my grandmother's porch is one very vivid childhood memory, and yep, removing those strings was a necessity. I really love them any way you want to cook them. I grew up with them boiled to death with lots of bacon and a splash of vinegar. I still love that but now days prefer mine cooked to tender crisp like your recipe here. Can't wait to try it. Hi Neela, this is an awfully good salad. Tastes even better than it looks! Thanks for the comment. Hi Maureen, isn't this a nice looking salad? And the flavor is wonderful! Thanks for the comment. Hi Peachy, will check that out! And this is such a good salad. ;-) Thanks for the comment. Hi Amira, really simple, and really tasty. ;-) Thanks for the comment. Hi Karen, I like the long-cooked beans with bacon, too. But they're really a different animal (and that's the only way to make out-of-season green beans taste good, IMO). This is almost the polar opposite of that recipe! Thanks for the comment. Perfect salad for summer! Love fresh green beans... I can bet it's delicious! One of my fav vegetable and you created such a yummy dish. Loved everything about it. Looks so tempting, amazing salad. Q: What kind of socks should you wear to plant green beans? I actually think green beans can be pretty good in the winter. At least they're a fresh green vegetable, you know? ;) I make salads just like this with them all the time. Your beans are perfect, so shiny and still look crispy, love it! Green beans with vinaigrette is my favourite summer side dish. So simple, and perfectly delicious. Isn't it great that spring is here and the produce is abundant? Hi Rosemary, we're not actually growing beans either this year for the same reason -- every farmer's market has them, and in good quality. ;-) So we'll try to outwit the squirrels growing tomatoes again! Thanks for the comment. Hi Marcela, I love fresh green beans too! Such a delish veggie. ;-) Thanks for the comment. Hi Minnie, isn't this nice? It really is amazing. ;-) Thanks for the comment. Hi Greg, LOL! Silly jokes really do appeal to us. How could you tell? :-) Thanks for the comment. Hi Carol, Mr. Bean is a hoot, isn't he? Such a funny show. Thanks for the comment. Hi Laura, we've sometimes found decent green beans in the winter, but more often than not, not. And isn't this a great salad? Such nice flavor. ;-) Thanks for the comment. Hi Katalina, love the look of a nice vinaigrette on green beans! It does make them shinny. Thanks for the comment. Hi Beth, isn't this a nice, simple dish? Really doesn't need a recipe, but I wanted to make them, so here they are. ;-) Thanks for the comment. Such a versatile dish -- and one that anyone and everyone will love. Definitely a great one to share at a potluck or any dinner party. Hi Rocquie, I use the same basic vinaigrette to marinade the beans, potatoes, etc. when I make Salade Nicoise. It's good stuff! ;-) Thanks for the comment. Hi Carolyn, the first time I made this salad it was actually to take to a dinner party! It's really perfect for that. Thanks for the comment. Wow! That is a prime example of how shooting in the raw and being tethered can do for food photography!!!! Simple and delicious and sharing everywhere! Hi Bam, :-) Fun dish to photograph! Plus it tastes awfully good. ;-) Thanks for the comment. Hi Dedy, yup, you speak the truth. :-) Thanks for the comment. Hi Charlie, I love the color of this! And how simple the recipe is -- perfect for this time of the year. Thanks for the comment. WE love green beans a lot. Just that off season, it's not the best. Growing up, mom used to cook the beans so much, that there was no vibrancy left, tasted good though. I enjoy the simplicity of it. I can't wait to get my hands on some good ones this summer. The salad is so fresh and those plump beans are amazing. Hi Asha, we like long-cooked green beans when they're done Southern style, but that's about it. Otherwise, lightly cooked is our favorite (anywhere from a bit of crunch to just beyond having any crunchiness). Thanks for the comment. Love the vibrant green color of these! It looks like the perfect side dish to any meal! Hi Juliana, this is such a nice dish -- loads of flavor, and so easy it'll get you out of the kitchen in a jiffy so you can enjoy the nice weather. ;-) Thanks for the comment. Hi Ashley, this is a great looking dish, isn't it? Love its flavor! Thanks for the comment. Wow, I didn't know about the raw thing. I have eaten them raw a few times - I guess it's a good thing I didn't have too many. Hi John, saw this dish on Bam's FB and had to come check out the bright, beautiful greens. So lovely! I love "green" beans. Those overcooked grey beans just doesn't get anymore. :) I am so ready for fresh produce. Hi Robyn, welcome! That raw thing is interesting, isn't it? And although raw green beans taste "OK", they're much better cooked IMO. Thanks for the comment. Hi Madonna, we're so ready for fresh produce too. And green beans are at the top of the list! Thanks for the comment. A lemony vinaigrette sounds so good for green beans! Freshly picked beans are hard to beat. I don't think you can ever have enough good veggie recipes. This sounds wonderful. Lemon goes so well with just about everything. Hi Lisa, lemon freak that I am, I often use lemon in a vinaigrette. Although a wine vinegar vinaigrette is awfully good in this recipe too. Thanks for the comment. Hi Chris, agree it's impossible to have enough veggie recipes! Although we love meat and fish, veggies are our favorite part of the meal. Thanks for the comment. This is such a simple and delicious salad! I usually just blanch or saute the green beans, but now I have a new recipe to try, thank you for sharing! Classic flavours, you can't go wrong with this throughout summer! Hi Jasline, that's what I usually do with green beans, too. But this is a really nice recipe when you want a change! Thanks for the comment. Hi Caroline, these flavors really are classic, aren't they? Such a great combo! Thanks for the comment. This is the perfect side for grilled meats, isn't it? So colorful and a vinaigrette packed with flavor. I can totally see this on plate next to grilled steak. Yum! Hi Kristi, this dish goes so well with grilled or BBQ meat! Thanks for the comment. I have been pinning so many salad recipes in preparation for the summer. I think I'll need to add one more! Haha- I think Mrs. KR needs to have her own full time comedy show! She is a hoot! This would be an awesome side dish to some grilled chicken! I usually salt my beans after they are cooked - but I gotta salt the water next time and I had no clue raw beans could be poisonous! Hi Cathleen, this recipe is really worth making! Loads of flavor, and so easy. ;-) Thanks for the comment. Hi Shashi, Mrs KR is a card, isn't she? ;-) And this would be terrific with grilled chicken! We often serve it that way. Thanks for the comment. Hey, I think I'll re-name my blog 'G'day String Bean'- they taste so good! Hi Fran, good idea! :D These little beauties do have wonderful flavor, don't they? Thanks for the comment. Hi Nami, green beans are so good, aren't they? We love this dish! And I'll bet you will too. And your kids will, when they get older. ;-) Thanks for the comment. This Summer we're planting a whole bunch of green beans in the garden so I can't wait to crunch down on this salad! It looks so refreshing! Hi Pamela, you'll love this recipe! So nice with your own green beans. ;-) Thanks for the comment. This sounds like a great way to serve green beans. Green beans are one of the vegetables that my family will eat, I will have to try this recipe when my green beans in the garden are ready. Hi Dawn, this is a great way to use green beans from your garden! I think you'll really like this recipe. ;-) Thanks for the comment. This is a lovely and light seasonal salad, John! Perfect for a hot summer day. Hi Amy, we love this dish! And it's been way too long since we last made it. But it won't be a stranger to our table this summer! Thanks for the comment. Hi Kumar, isn't a garlic vinaigrette so nice? Love its flavor! Thanks for the comment. This is one of my favorite preparations for green beans this time of year. Love your garlic dressing. Gotta try that very soon. Great post, John! Hi Bill, green beans done this way really do taste great at this time of the year. Love them! Thanks for the comment. Hi Helene, we get pretty good local green beans starting about now, but really around here June and early July are best. Nothing beats them out of your own garden, though! Thanks for the comment. The beans at my local farmers markets are stella at the mo. They really haven't been lasting long enough (we eat them raw as a snack) to try cooking fancy like, but.... I shall make an effort this week, these flavours sound great. Hi Anna, glad you're still getting great beans! They don't last long at our house either -- but it's worth buying some extra so you can make this dish before you snack on them all. ;-) Thanks for the comment. I'm a lover of simple green beans, but definitely only when they are in season like you! Hi Amanda, really hard to beat green beans, isn't it? This has so much flavor. And it's so simple! Thanks for the comment. I was just thinking about a green bean salad so I'm delighted to see yours, John! Lovely flavors. As always, I enjoy your banter with Mrs KR! Hi Hannah, green bean salads are so simple, but so good. One of our favorite warm weather foods! Thanks for the comment.